Do you want to lose weight? Here’s part 12 of 17 in a series of blog posts on the subject. You can read the whole series on the How to Lose Weight page. On the other hand, reliable access to vitamins and minerals could perhaps mean decreased hunger levels and decreased cravings, thereby promoting weight loss. The above is, of course, speculation. But now there are well-performed studies which suggest it might not be far from the truth. In one of the studies, 77 overweight or obese women received either a supplement of 1000 units of vitamin D, or a placebo, every day for 3 months. Those who took the vitamin D supplement decreased their body fat by 2,7 kg (6 pounds) – significantly more than the placebo group, who hardly decreased their fat weight at all. Nutrient-dense, good food is certainly the foundation of weight loss. But an adequate amount of vitamin D can be difficult to ingest via food. In the case of a lack of sun (such as during the darker months of autumn and winter), it’s wise to supplement for multiple health reasons – and perhaps even for your weight. If you’re overweight and not entirely sure that your diet provides enough nutrients, it may be worthwhile to take a multivitamin pill. Unfortunately, they still contain only minimal doses of vitamin D, so you should really be taking both. This makes perfect common sense to me Dr Andreas: from jungle elephants which know just where to "mine" for the minerals lacking from their diet, to the cravings of an heavily pregnant woman at 3am; I am convinced that our bodies innately know what they need to be nutritionally complete, and that we are likely to perceive as hunger any lack in our diet -- malnourishment in the midst of apparent plenty on the western industrialised diet. As I recall, Gary Taubes in GC,BC recounts experiments where rat food is "diluted" with water or clay... the rodents compensate by eating a greater volume in order to maintain the same nutritional input. Once again it is a question of quality more so than quantity. For myself, I prefer to source my food locally and seasonally. And with my favourite grass-fed beef, I endeavour to eat more of the animal than just the muscle and fat... bone stock, marrow, liver etc... often these cheaper cuts can be the most nutritious. Three distinct classes of BMI trajectories were identified: "stable overweight," "obese gaining," and "obese losing." Relative to the stable overweight class, which comprised about 90% of the sample, the obese gaining class had approximately 50% higher mortality risk; the highest mortality was found in the obese losing category. The results were similar for men and women. The findings highlight substantial heterogeneity in weight trajectories of older Americans, as well as large survival differentials across the classes. The direction of weight changes appears inextricably linked to the overall BMI level in terms of predicting older adults' longevity. Weight loss is associated with particularly high mortality risk even when the typical BMI change is from obesity to overweight. 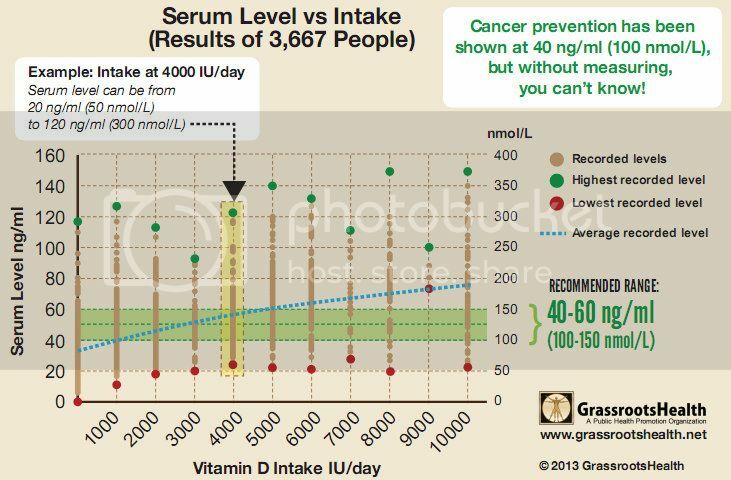 I think it's important for older people when losing weight to keep to a nutritionally rich diet and that may mean using EFFECTIVE strength Vitamin D3 depending on current weight and 25(OH)D. optimum for controlling inflammation is 50ng/ml =125nmol/l. We should also be aware modern foods tend to have less magnesium than previous generations would have obtained, so as magnesium is required to enable Vitamin D3 to switch to it's active form, it's sensible to use a magnesium supplement with each meal and before bedtime while using effective strength vit D3. Most of us also have high omega 6 levels in relation to our omega 3 status. Reducing omega 6 (corn, soy, safflower oils etc) while increasing omega 3 (fish oil, krill, algae sourced) also helps resolve inflammation and increases production of the active hormonal form of vitamin D3. Thanks for this post, Dr. Eenfeldt! It turns out, there's a huge variance in the actual potency of Vitamin D pills vs. the labeled potency. This, no doubt, can make life difficult for the LCHFer who is trying to do the right thing regarding supplementation. But that really is irrelevant compared with the HUGE range of individual response to vitamin D supplements and sun/uvb exposure generally found. It doesn't matter if you take 1000iu daily or 10,000iu daily the difference between the lowest responder and the highest response is 100ng/ml or 250nmol/l. So irrespective of whether your supplements are high or low strength compared with what's actually written on the label you NEED TO TEST 25(OH)D and the same applies to sun or tanning lamp usage. You can't guess your response so you HAVE to test regularly so you know how your body responds to the supplements you are using and adjust your intake when you get the results. Don't think it's just over the counter Vitamin D Dekristol the prescription D3 had a recall for similar reasons. Is there a trustworthy test for the wide range of vitamins and minerals I might be lacking in? Also - if the resorption factors differ extremely from person to person, why should I believe that we are "normed" for certain blood levels of these vitamins and minerals to test against? And why should I believe the recommended blood levels for D3 more than the RDA figures for "healthy" eating? Yes.. there is, but those are taken by your MP, as a diagnosis of your symptomes! And they take only those they think is a part of your problem. But if you have a big purse, then you can always persuade him/here to do a lot of them.. if you pay for it! Great article. What do you think is the best vitamins for kids is? Egg and liver.. with some green veggies! Egg and green leavy veggies every day and liver ones every second week. Fish at least twice a week! The advice was for growen up that have problems to lose weight.. to see if there is something missing in there diet. And if one find that it is a particuly vitamine and/or mineral.. then one can adjust ones diet. The best for kids is parents cooking real healty food. Should I stop taking my vitamin D in the summer months or when going on the sunbed or holiday abroad. I live in UK so not much sun anyway, but going to spain for 2 weeks. Should I stop taking them then ? Can you take too much vitamin D ? @ Should I stop taking my vitamin D in the summer months or when going on the sunbed or holiday abroad. I find I need to take 5000iu daily throughout the year. I use a sunbed in winter and UVB from sunlight whenever possible in summer but I still need to increase my vitamin D from supplements to 7500iu in winter. I think it's impossible to give a precise answer because everyone is different. There are some people in the UK who get to 125nmol/l on just 1000iu daily and some people for whom just 5000 iu raises 25(OH)D over 185nmol/l . City Assays Vitamin D Blood Spot Test. I think if I were going to Spain I'd probably not bother the take the supplements with me. However I'd be sure to keep my Natural Sunscreen Options - Healthy Fellow as good as possible and I would Eat MY Sunscreen? - Wellness Mama Starting now you'd see a significant improvement in your skin's natural photo-protection in just 12 weeks though the longer you persist the less chance you have of burning. (which you should avoid at all costs) I've not used suncreen for years but as I stay in the UK that's probably why I find I don't need it. Hopefully we will see some decent sunshine this year. This was the first time I tried the Lady Soma Detox - and before this, I have never used any kind of diet pill, I always relied on self-control, diet and exercise, but that didn't seem to suffice anymore after I turned 40. The Lady Soma Detox actually worked for me. Also, no weird palpitations or jitteriness, although I drink 3 cups of coffee a day as well. I lost 8 lbs in 1 mo, but even better, I lost inches in my target areas and my clothes fit great again. I already recommended the Lady Soma Detox to family and friends and plan to take it for another couple of months. Good luck! These multivitamins are very useful especially in winter seasons when the sun doesn't appear then we can take vitamin D with your supplements. Your medical supplements are really beneficial for our all Stages in Weight Loss and health also. I am so glad to read about the importance of these vitamins and I think these are also free from side effects and good for our health and perfect fitness. I will try this option soon. My name is Alec Mwali and I am a Business Development Manager at seekinghealth.com. Ipersonally value quality content andI was truly fascinated by what you are doing back at http://www.dietdoctor.com,I feel that it will be a good opportunity for us to form a partnership. I take salmon oil cold pressed 1000iu/day mixed with D3 -2000iu/day. I read D3 ( O6 produce inflammation) + O3 ( decrease inflammation) are dangerous together. I am also on LCHF. Can you assure me these pills are not damaging my sistem? I am also drinking magnesium in lemon water. Thank you! I'm too late on your blog. Appreciate your efforts for giving out such an outstanding blog piece. Very less people are interested in in-depth study about the reasons for weight loss. Moreover which vitamins and minerals are essential for weight loss. Thanks for sharing the blog piece for readers.